Your attic is much more than just a storage space. It is a part of your overall roof system, and in order to get the most from your roof you will want to make sure that your attic is properly ventilated. Not only can proper attic ventilation keep your energy costs down, it will help your roof last as long as possible. Proper ventilation necessitates that fresh air is able to find its way in the attic space, while allowing stale air to get out. This is accomplished through the placement of ventilation near the bottom of the attic space at the soffits or eaves (intake), and at the top peak(s), or ridge(s), of your attic space (exhaust). This will permit the circulation of air, which will keep the attic space at a uniform temperature and humidity level, regardless of the season. In order for attic ventilation to work effectively, however, the ventilation system must have balanced intake and exhaust. 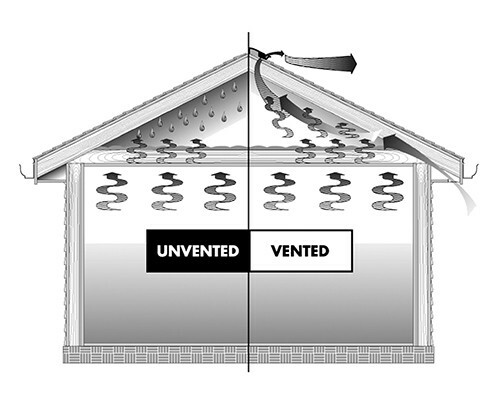 Balanced ventilation is achieved when intake and exhaust allow for same amount of airflow, because the natural forces of air pressure create a push-pull effect around your roof. Without proper exhaust, hot air cannot escape. Without proper intake, air will only circulate across the top of the attic space, leaving stagnant air at the bottom of the attic. Circulation is also restricted when there are vents on only one side of the attic, similar to the effect one would get if only opening windows on one side of a house on a breezy day. Since hot air rises, warm air naturally makes its way into an attic, and it will remain there if the space is poorly ventilated. On a 90° day, attic temperatures can reach 140° or higher, and this unventilated air can work its way back into lower level living spaces and cause AC units, fans, and other energy consuming appliances to work harder. This is no small thing when you consider that cooling accounts for 6% of total utility costs in the average home (http://energy.gov/articles/energy-saver-101-infographic-home-cooling). With proper ventilation, however, this warm air find its way up and out of the home rather than staying trapped. Winter weather can also presents challenges for attics. As temperatures plummet, the warm, moist air that rises from living spaces into an improperly ventilated attic will condense on cold surfaces. Over time this moisture can build and cause the roof decking to buckle, swell, and rot, making it unable to hold nails securely and reduce its load capacity. Condensation also creates optimal conditions for mold and mildew growth, which affects allergy sufferers and has a negative impact on indoor air quality. During the winter, heat trapped in the attic causes snow on a roof to melt and slide downward toward the eaves and gutters, which are not exposed to the heat from within the attic. When the snow melt reaches these cold areas it can refreeze, creating a buildup that will dam additional snowmelt, which then refreezes. This continual buildup of ice is called an ice dam. This is dangerous because water expands when it freezes, and the expansion of pooled water refreezing can push roofing materials apart and allow water to infiltrate the roof system. If left unchecked, this infiltration can soak through roof decking, and may even make its way inside living spaces to ruin paint, mark ceilings, and stain walls. A properly ventilated attic space, however, will exhaust the heat, remain uniformly cool, and not allow this harmful freeze-thaw cycle to take hold. Have no fear – just because your attic is not properly ventilated does not mean that you need to replace your roof system. Proper ventilation is a simple but effective way to protect your investment and your wallet, and there are ventilation options for all roofs that will prevent your home from encountering any of the above mentioned issues. To discover which venting solution is best for your home reach out to a roofing professional and request an inspection. Many roofing professionals will offer to inspect your roof system at no charge.